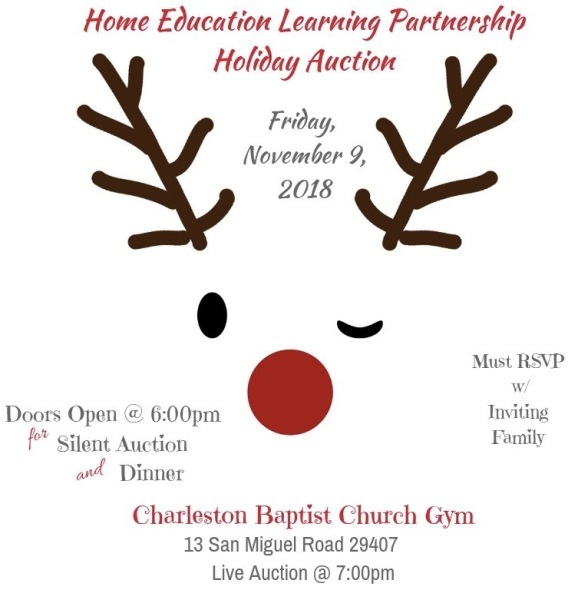 The Home Education Learning Partnership will be hosting its 11th annual fundraising event on Friday, November 9, 2018. Funds raised will benefit our overall program by strengthening and expanding the H.E.L.P. opportunity in the Lowcountry. We are excited to announce that we are able to expand by offering classes for special need students in the Greater Charleston homeschool community in the 2018-2019 school year. In addition, this year a percentage of funds raised will provide a college scholarship to be awarded at our Year End Celebration in April. We will auction a variety of services, products, gift certificates, gift packages, trips, camps, educational resources and more. Your participation in our auction will position you and your business in front of Lowcountry families just in time to assist them with their holiday shopping needs. We invite you as community leaders and local business owners to join us in this worthy cause. We invite you to make a donation to benefit this fund-raiser. Your participation in our auction would be greatly appreciated! We will follow up with you again to dialogue about your interest and level of participation in contributing to this year’s auction. You may mail certificates to the address given above, or we will be happy to pick up your donation for the fundraiser. Our organization serves the entire Greater Charleston area; therefore, we thank you for your consideration of this important opportunity for families in our city. H.E.L.P. is a non-profit organization. Therefore, all donations are tax deductible. Please know that all donors will receive a letter of confirmation following our auction. This letter can be used for your tax purposes. Again, we thank you for your consideration in supporting our great cause!